While on one of my scouting tours through the Gardens, Mike Bone, curator of steppe collections and one of the horticulturists that manages the Steppe Garden, informed me that the red hot poker plant (Kniphofia stricta, also known as a torch lily) had some interesting fasciation going on in the flower stalks in the Steppe Garden. 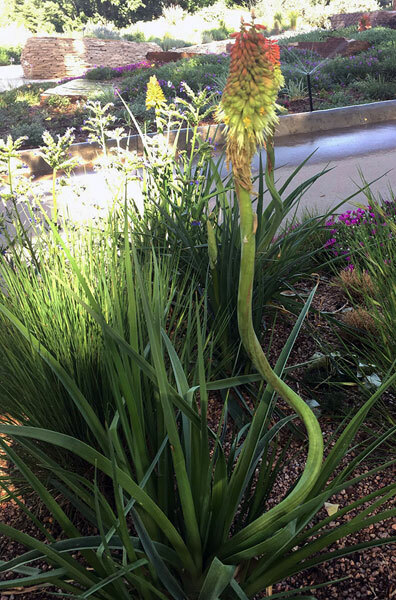 The torch lily flower stalk is twisting, and some flowers are divided into two. These are some common symptoms of fasciation. Another symptom is a flattened flower, which can be seen in the blanket flowers (Gaillardia aristata) in the Ponderosa Border just east of the UMB Bank Amphitheater. Other symptoms of fasciation include a flattened ribbon-like stem, bushy growth or twisted stems. Fasciation is typically a mutation or deformity that occurs in the meristem of a plant. Meristems are where cells begin to form – similar to stem cells in humans, these cells divide and then specialize, becoming the cells that make up the leaves, stems and flowers. Sometimes a mistake happens, resulting in an abnormal growth. These mistakes can be caused by anything from a defect in the DNA code in the plant, to a viral infection, to insect damage. It can even be something environmental that causes this. Because there are so many different causes, there is no one cure. In some plants, like the cockscomb flower (Celsoia cristata), this mutation is transferred by seed, allowing us to enjoy the unique, rooster comb-like flowers year after year. In others, like the torch lily or blanket flower, it is a physiological response, and typically will revert back to “normal” in later flowers or next season. If you’re not keen on how it looks, pruning it out is an option, as this mutation doesn’t generally affect the health of the plant. Otherwise, enjoy the funky flowers and stems! ‹ Previous Article: The High Line Canal: Which plants green this greenway? Great article, learned something new! Thanks, Jessica! Glad I could shed some light on some interesting plant facts!